By using the volumes of "Soldiers Died in the Great War" (SDGW) as a foundation and amending the roll according to information found in the battalion War Diary, regimental history, newspaper articles I have come across, Commonwealth War Graves Commission (CWGC) database details and the officers' service records (where available), this roll is as accurate as I can achieve. Any additions or amendments will be added as I come across them but please contact me if you are aware of a discrepancy in the details shown. This roll of honour is in chronological order of the date the Officer in question died. Donald was gazetted as an Officer on the 8th February 1915 and arrived to join the battalion in France on the 1st August 1915. He spent his entire period of service on the front around Fricourt and Carnoy at the southern end of the British line and was killed during a lively day of exchanges with the opposing Germans in their trenches. His death was announced in the London Times on the 26th January 1916. Donald was the son of Herbert Wade and E. Mary Whatmoor of "Briarfield", The Drive in Northwood, Middx. He is buried in the Meaulte military cemetery. Killed in action 26th June 1916, aged 23. Reginald was born on the 5th June 1893, the son of Herbert Edwin and Blanche Ada Baden of 5 Grange Road in Ealing, London. He was schooled at Ealing Grammar and went on to work as a clerk in Burroughs, Wellcome & Co.
Reginald enlisted into the British Territorial Army on the 9th February 1912, joining the 9th County of London Regiment as private 1415. His younger brother, Bertram, enlisted with him, becoming Private 1414. At the time, he was 18 years and 8 months old and lived with his parents at 5 Grange Road in Ealing. Rifleman Baden stood 5 feet, 4 inches tall and attended the Territorial Army's summer camps in 1912 and 1913. When war broke out on the 5th August 1914 Rifleman Baden was embodied for service and was amongst those Territorial soldiers who were posted to France very early in the war, landing on 4th November 1914. On the 8th December he was discharged from the ranks and sent back to England, having been granted a commission as an officer. His brother Bertram Baden (born 12th January 1895) had served alongside him in the Territorials and also applied to become an officer at the same time. They were separated despite a request to remain in the same unit, with Bertram being posted into the Worcestershire regiment and later rising to the rank of Captain. Reginald was trained as an officer in C Company of the 7th battalion of the Bedfordshire regiment and went to France with them in July 1915. Between the 25th October and 2nd November 1915 he went home on a spell of leave but otherwise served with the battalion in the Carnoy area, east of Albert on the Somme. On the 26th June Reginald and his fellow Company Officers were settled into their mess to the rear of the front lines. The week long bombardment on enemy positions before the Battle of the Somme was still going on and German artillery retaliated, with one shell smashing through the roof of their Company mess. 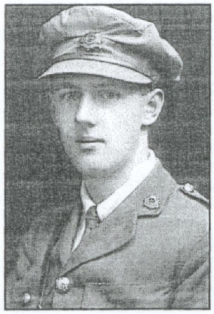 Reginald was one of two Officers killed outright by the shell, the second being Gordon Haslar (listed below). Reginald is buried in the Carnoy military cemetery, alongside 2/Lt Haslar (below). His Officers service number was 52215 and his record is held by the National Archives, under reference WO339/29843. Gordon was born on the 10th March 1897 at 9 Arbuthnot Road, St. Catherine's Park in Hatcham, Deptford South, Greenwich, Kent (now London SE14), the second son of John Hasler (a school teacher, who was known as Jack Hasler) and Jessie Hasler (nee Jones). On the 8th October 1914, he was accepted as a Cadet in the University of London OTC and applied for a commission on the 18th November 1914, citing the 8th Bedfords as his preferred unit, presumably in an attempt to follow a friend into that unit. His age appears to have delayed his acceptance, which was considered further in January 1915. He stood 5 feet, 10 inches tall and had a five inch chest expansion (almost twice the 'normal' expansion seen on such records). Gordon was finally gazetted as a Temporary Second Lieutenant on the 15th February 1915 and trained in the 9th battalion of the Bedfordshire regiment. Second Lieutenant Hasler was examined by a medical board and classed as medically unfit for service on the 21st March 1916, the curious disability being classed as dermatitis capitis (a form of cradle cap), complicated by swollen glands and repeated headaches. By the 22nd April the problem was solved and he was classed as fit for general service, joining the 7th battalion in France on the 27th May 1916. Sadly, he was the second man killed during the shelling on 26th June as he rested in the Company Mess, having been on the front lines for around a month. Curiously, his service record, the War Diary, his London Times obituary and the Regimental Medal Rolls record his death in June yet the CWGC and SDGW records list it as happening in July, although this error is in the process of being corrected. At the time of his death, his family lived at 68 Lonsdale Road in Barnes. Two of his brothers were also officers in the army, with Harold John Hasler serving as a Lieutenant in the 121st Pioneers in India and Stanley Ronald Hasler as a Lieutenant in the Royal Artillery. 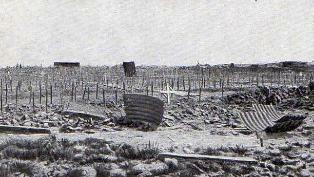 A photograph of Gordon's grave is shown opposite, from the Carnoy Military cemetery where he lies. His Officers service number was 61101 and his record is held by the National Archives, under reference WO339/32361. John Morrison, a distant relative of Gordon's, adds this interesting piece of family information. Gordon's father John was born John Hasler Hitchcock, but his wife Jessie did now want to be known as Mrs Hitchcock (for decency reasons apparently) and she made him change his name. He became John Hasler Hasler and their eldest son was born Harold Hitchcock but the others (Gordon, Stanley and Douglas) were all called Hasler. The opening day of the Battle of the Somme - 1st July 1916 - was to become the bloodiest day in British military history. The 7th battalion were in the front waves of the assault that would see little gains at the cost of 57,000 British casualties that day alone. However, the Bedfords were one of the few to not only make it into the German lines but to take their second line positions as well as storming and holding the formidable Pommiers Redoubt. That day would see them in a large scale offensive action for the first time since ther formation, and by the end of their assault 2 Officers were killed and 13 more wounded with around 320 men killed, wounded or missing. The next two Officers are those who lost their lives that fateful day. Joscelyn was born on 4th August 1895, the youngest son of the Reverend and Mrs F. Russell Rawes from 140 Cherry Hinton Road in Cambridge. He was educated at the Grammar School in Bury St. Edmunds and Perso School of Cambridge, where he was Captain of the Rugby Team, the Head Boy between 1913 and 1914 as well as being the Colour Sergeant in the O.T.C. He also won an exhibition at St. Catherine's College, Cambridge and had just left school when war was declared. Joscelyn Rawes enlisted in September 1914, at which time his father was the vicar of Sandy in Bedfordshire and lived at Hatley St. George Rectory in Sandy. After training, he became a Second Lieutenant and went to France with the 7th battalion in July 1915. The 19 year old stood at 5 feet 7 inches tall and spent his first year in the trenches around Carnoy, east of Albert on the Somme. Lieutenant Rawes was in the very front wave of the assault on the 1st July 1916, leading B Company out into no-man's land. He left the trench at 7.28am and immediately came under machine gun fire but made it all the way across no man's land at the head of his men. He fell as he arrived at the first line of German trenches, just before 8am. Lieutenant Rawes' runner, Private 13944 N. Faulkner wrote from hospital a few days later that he was just behind Lieutenant Rawes as they tried to get through the German barbed wire, around 10 yards from the German front lines, when a bomb exploded next to him and the Lieutenant doubled up and fell to the ground. In a curious twist, his batman (officer's servant) at the time relayed the story to his father that Joscelyn had been 'blown to pieces', presumably to allay any fears that his family had of him suffering, although, sadly, it seems to have caused more dismay than comfort. The issue was resolved after several letters between his father and the War Office, although his batman's report of a wooden box with his items inside it going missing was not. One of the War Office's replies even goes so far as to remark "the late officer's servant would scarcely appear to be a 'reliable man'", referring to the servant's statement that the box existed in the first place. This would seem a little unfair, given that his batman returned Lieutenant Rawes' personal effects gathered from his body to his family, which included a silver cigarette case. Lieutenant Rawes' body was recovered from the battlefield and is buried in the Carnoy Military Cemetery some weeks later by another regiment once the fighting had moved further north-east. His brother served in the South African Wars of 1899-1902 and also flew in the R.F.C. during the Great War. Around September 1916, he went to try to locate his brother's final resting place at Carnoy but was unable to find the cemetery. In a further confusing addition to his service record, a letter to Joscelyn's father dated to January 1920 states that his grave was moved to the Dantzig Alley British Cemetery, yet today it remains in the Carnoy cemetery where he was originally interred. Killed in action 1st July 1916, aged 35. James was in the 9th battalion, attached to the 7th when he was killed and arrived in the battalion on the 25th May 1916. He had been on the line for 6 weeks and fell during the opening day of the Somme offensives of 1916 as the battalion went into action for the first time. He was formerly a Lieutenant with Transport and Remount Department of the West African Forces and was the son of James Cunningham of Ashfield in Craigmore, Rothesay. James has no grave but is remembered on the Thiepval memorial to the missing. Second Lieutenant Evelyn Walter James JOHNSON. Evelyn Johnson received his commission as an Officer on the 21st January 1915, and arrived with the battalion early in 1916. He was wounded on the 26th June when a shell fell through the roof of C Company's Officers Mess, having only been with the battalion a few months. After struggling against his wounds for several weeks he finally died whilst in the General Hospital in Rouen. He was the son of Anthony Charles and Helen Johnson of 79 Huron Road in Balham, London and is buried in the St. Sever cemetery, Rouen. His record is held by the National Archives, under reference WO339/33223. David was commissioned with his brother Oscar Dunsford Roeber as a 2/Lt on the 7th May 1915 and David arrived in C Company on the 15th/16th July 1916, where he served until his death a month later. On the night of the 14th/15th August 1916 the battalion launched a dummy raid on the German trenches to keep them on edge. The German artillery barrage sent in response was "feeble" but still killed David and 3 of the men who were manning the British trenches. He was serving in the 3rd Reserve battalion but attached to the 7th battalion when he died. David was the son of A.O. and M.I. 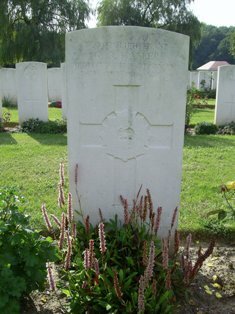 Roeber of 21 Honor Oak Road in Forest Hill, London and is buried in the Ration Farm Military cemetery, La Chappelle D'Armentieres, near Armentieres. His record is held by the National Archives, under reference WO339/4136. On the 28th September 1916, the battalion assaulted the "impregnable" Schwaben Redoubt, on the Thiepval Ridge that had stood firm against several attempts to take it since the opening day of the battle of the Somme. The 54th Brigade had taken half the village of Thiepval on the 26th, leaving the Bedfordshires the northern half, which they took the following day. The 28th saw them storm and successfully take over half of the redoubt, with the final sections being taken on the 14th October by the 1st/1st Cambridgeshires. Fifteen Officers were killed or wounded in the assault as well as over 100 men. 7 Officers were recommended for gallantry medals including Thomas ADLAM who would become the battalion's first Victoria Cross winner; a further 8 DCM's and 21 Military Medals would be awarded between the "Other Ranks" after their assault. Below are those five Officers who lost their lives fighting for the Schwaben Redoubt. Ian was commissioned as a trainee Officer on the 23rd February 1915 and arrived with A Company of the 7th battalion in France early in 1916. His death was recorded in the London Times on October 4th. Ian was the only son of Mr and Mrs Ross-Taylor of Daws Hall, Lamarsh in Essex. He has no known grave but is remembered on the Thiepval memorial to the missing. His record is held by the National Archives, under reference WO339/35930. Killed in action 28th September 1916, aged 22. 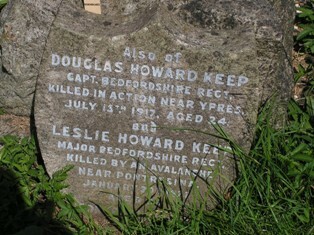 He was the son of Albert and Helen Alice Howard of 10 Cutcliff Place in Bedford and is buried in the Mill Road Cemetery in Thiepval. Killed in action 28th September 1916, aged 21. Robert and his younger brother (John Norman Hunston) were gazetted together as trainee Officers on the 13th June 1915 and both served in the Bedfordshire Regiment. 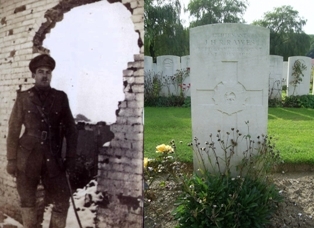 John was a 2/Lt who fell in the 6th battalion 15th July 1916, aged 20 and Robert served in the 7th battalion, arriving with them on the 20th July 1916, five days after his brother had died. On his arrival, Robert was posted to A Company where he served until his death in combat two months later. Both men were the sons of Robert George Laskey and Helen Hunston of 32 Hallewell Road in Edgbaston, Birmingham. Robert is buried in the Mill Road Cemetery in Thiepval. Thomas was gazetted a trainee Officer on the 30th April 1915 but did not arrived in B Company of the 7th battalion until the 15th/16th July 1916. He is buried in the Mill Road Cemetery in Thiepval. Herbert was gazetted as a 2/Lt on the 5th August 1916 and had only been with the battalion in the field a matter of days before his death. He arrived on the 17th September in a draft of three new Officers, only one of which survived. Herbert fell eleven days later during the assault and was in the 9th battalion nut attached to the 7th upon his death. He was the son of James H. and Maude Merchant of 134 Castle Street in Luton. Herbert has no known grave but is remembered on the Thiepval memorial. Henry was born in Hyde, Cheshire and was educated at the Radcliffe University College, Oxford. Second Lieutenant Potts served in France with the 7th battalion from August 1915 and was mortally wounded during the assault on the Schwaben Redoubt. Although he was moved to the medical facilities on the coast, he died from his wounds a few days later. 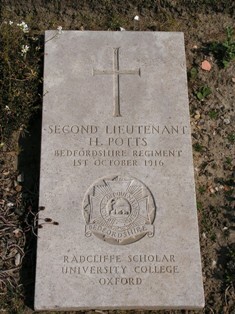 He was the son of Jabez and Hilda Alice Potts, of 1A, Cato Rd., Clapham, London and lies in the Boulogne Eastern cemetery. On the 3rd May 1917 the battalion attacked German lines south of Cherisy during the Third Battle of the Scarpe, during the Battle of Arras. They had experienced no Officer deaths since Schwaben last September despite being in the Ancre operations that February and March when Christopher Cox had won a Victoria Cross. However, uncut German wire trapped the battalion in no-man's land in front of Fontaine Wood and 13 of the 22 Officers who went into action were killed or wounded, as well as almost 250 men that day. The following six Officers were killed and died of their wounds received at Cherisy that day. Killed in action 3rd May 1917, aged 31. Wilfred joined the battalion when war broke out and trained with the newly formed unit until they landed in France on the 26th July 1915. The 11th October 1915 saw him take over command of B Company and between the 1st and 9th November 1915 he enjoyed a spell of leave to England. Captain Bull sat with Captain Keep in a Field General Court Marshall on the 2nd May 1916 and led the right side of the assault on the opening day of the Somme offensives of 1916. He was severely wounded by shrapnel at around 8.30am on the 1st July 1916 as he led his Company to the outskirts of the Pommiers Redoubt and wrote the subsequent report on the battle which can be seen here in the 1916 Appendices. After nine months convalescing, Wilfred rejoined the battalion on the 3rd April 1917, exactly a month before he fell at Cherisy. He was described as "One of the finest officers we ever had" by his men and fell amongst the front ranks as they tried in vain to force a way through the wire that was swept by machine gun fire that day. He was the only son of C.H. Bull from The Homestead in Elstree and partner in the firm Hibberd, Bull & Co. at 6a Devonshire Square in London. His death was recorded in the Times on the 15th May 1917 and he is buried in the Cerisy-Gailly French National Cemetery, 10km south-west of Albert on the Somme. 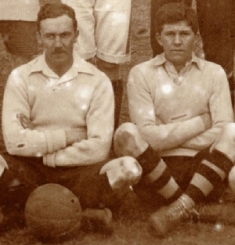 Captain Bull and Lieutenant Sherwell can be seen above before a football match in 1915. Edward had not been with the battalion long before his death, which was announced in the London Times of the 18th May 1917. He was the eldest son of Alice Mary Lingwood of Westleton, Saxmundham in Suffolk, and the late Edward Thomas Lingwood. Edward had no known grave but is remembered on the Arras Memorial to the missing. Killed in action 3rd May 1917, aged 19. Cridland arrived with the battalion on the 25th May 1916 and came through both the opening day of the Somme offensives as well as the Schwaben Redoubt assault in September. On the 10th December 1916, he was appointed as battalion Sniping Officer but was killed opposite Fontaine Wood along with many of his men. He was the son of J. and I.E. Luscombe of Marridge, Ugborough in Devon and is remembered on the Arras Memorial. Before the war Lionel earned a B.A. (Lond.) and worked as a Civil Servant. The London Gazette records Lionel was moved to the battalion whilst training on the 14th January 1915 and was gazetted as a 2/Lt on the 25th October 1916. However, he did not arrive in the battalion until the 12th November 1916 and was killed several months later, during the Arras Offensives. 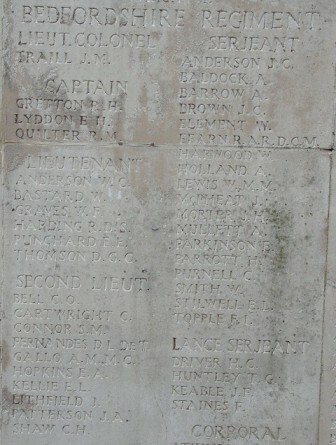 He was the son of George Sample Angas and Charlotte Gertrude Angas of 11 Winchester Road, Highgate in London and is remembered on the Arras Memorial. Chester Bishop Kydd was born on 31st May 1897, the only son of Dr. John G A Kydd and his wife Jessie de Mott Bishop. The family lived at Shantallagh in Coleraine, Co Londonderry. He was gazetted a 2/Lt on the 18th June 1915 and arrived in the 7th battalion on the 15th/16th July 1916, along with several other Officers who formed replacements for the losses sustained on the 1st July. 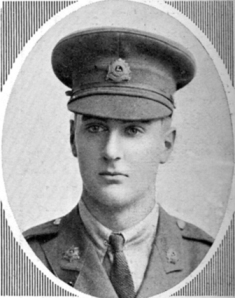 Second Lieutenant Kydd was killed in action leading B Company in the attack. The Company was trapped around Fontaine trench in a deep belt of uncut wire and were being badly mauled by MG & sniper fire. Of the company officers who started out that day, only two came out of the action unwounded. His batman, Private H.H. Gladwish, was with him when he was shot in the chest and tried to carry his wounded charge to the British line, but he was forced to shelter in a shell-hole. It was there that 2/Lt Kydd died. Private Gladwish, isolated and trapped by the constant shelling, spent almost seventy-two hours in no-man's land trying to make it back to British lines by night and hiding in shell holes during the day, without food, water or contact with anyone alive. When he ultimately got back to his own lines "looking like a hunted creature", he was too exhausted with hunger and grief to tell a coherent story but was to be awarded the D.C.M. for his gallantry. Chester Kydd had no known grave but is remembered on the Arras Memorial to the Missing. Died of wounds 17th May 1917, aged 28 Cadet Sidney Tremeer was promoted to a 2/Lt on the 5th August 1916 and arrived with the battalion on the 17th September 1916, along with his fellow Officer cadet Herbert Merchant who was killed just ten days later (see above). Sidney was wounded at Cherisy on the 3rd May and died from his wounds two whole weeks later whilst in Le Treport general hospital on the coast. 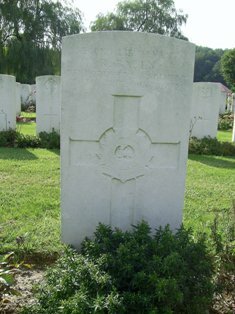 He was the son of Charles George and Eleanor Agnes Tremeer of Chiswick in London and is buried in the Mont Huon Military Cemetery, Le Treport. "For conspicuous gallantry in action. He organised and led repeated bombing attacks on the enemy strong points. On one occasion, with only three men and no bombs, he remained in close proximity to the enemy for one and a half hours." Douglas became the acting Captain of A Company on the 4th November 1916 and was later confirmed as full Captain from 28th October. Having survived the 1st July 1916 and the Schwaben Redoubt assaults as well as the Ancre operations and the Arras battles Captain Keep was killed by a shell whilst his party of men buried cables on the West edge of Zillebeke Lake near Ypres. His body was recovered and he was buried on the 16th July with full military honours, which is even recorded in the war diary. Douglas was the son of the late John Howard Keep and Mrs. Keep, of Abbots Langley in Herts. He is buried in the Reninghelst New Military cemetery, 10k south-west of Ypres centre. His service record is held at the National Archives, reference WO339/19432. The war diary records; "The battalion famous for its fighting spirit in the past eclipsed all former deeds of gallantry, when heavy wire held up the foremost men, those behind stood on lumps of earth and rubbish and fired over the heads of those cutting the wire, seldom have any troops shown such brilliant dash and utter contempt for the Bosch". Nevertheless, Officers and around 260 of the battalion became casualties fighting for what remained of the wood, including the following two Officers who lost their lives that day. Frederick Halsey arrived with the battalion sometime in 1917 and was in B Company on the left during the assault on Glencourse Wood where he fell. He was posted missing 10th August but later found and buried in the Hooge Crater Cemetery, 4km east of Ypres centre; a picture of the cemetery from the war can be seen below. Frederick was the son of David Daniel and Mary Ann Halsey of 3 Frithesden, near Hemel Hempstead in Herts., and the husband of Esther Halsey of 7 Wellington Street in Bedford. His service record is held at the National Archives, reference WO339/122616. Killed in action 10th August 1917, aged 19. Samuel arrived in the battalion during 1917 and fell whilst in D Company, who were initially the Reserve Company of the assault. He was the son of Emily C. Connor, of Ockbrook, Derby, and the late Rev. James Connor and is remembered on the Ypres (Menin Gate) Memorial which can be seen above. Robert was born 2 October 1892 and served in the 6th Norfolks between march 1909 and October 1912. A Solicitor's Clerk from Lowestoft, he enlisted back into the 2/6th (Cyclist's) Battalion of the Norfolk regiment as Private 1164 on 7 August 1914. After training, Private Ransom landed in France 25 May 1916 and was attached to the 2/6th Gloucestershires. He was promoted to Corporal 29 July 1916 and, after a fortnight in hospital in September suffering from Impetigo (probably as a result of trench conditions), became a Sergeant on 27 December 1916. Sergeant Ransom applied for a commission in February 1917 and, after Officer Training from April, was gazetted as a Temporary Second Lieutenant in the Bedfordshire Regiment 27 June 1917. Robert appears to have been married before his return to the front lines and he arrived with the 7th Battalion on the front line 28 September 1917, on the evening the battalion celebrated the Schwaben Redoubt victory from a year before. Within three weeks he was mortally wounded, possibly during the heavy gas shelling endured by the battalion on 19 October, although this is unconfirmed. 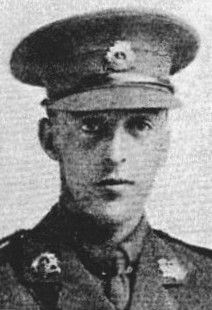 Second Lieutenant Ransom died from his wounds in the main XVIII Corps dressing Station at Minty Farm, north-east of Ypres. His body was interred behind the station, now called Minty Farm cemetery in Langemarck. Graham was educated at Hitchin Grammar School and was the champion swimmer on the H.M.S. Worcester before the war. Although he passed his RNR exams in 1915 he was found to be colour blind so was subsequently rejected and pursued a position in the Infantry instead. He joined the Inns Court OTC and was commissioned into the Bedfordshire regiment in April 1917, joining the 7th battalion in August 1917. Three months later he was killed whilst the battalion held the lines near Boezinghe, possibly during a relief. Graham was the second son of Dr. James H. and Beatrice M. Gilbertson of Hitchin in Herts. He has no known grave but is remembered on the Tyne Cot Memorial to the missing. Arthur joined the 8th Battalion on the 3rd February 1918, only to find the battalion about to be disbanded in line with the major reorganizations of the time. He was transferred into the 7th on the 9th February 1918, only to be mortally wounded when a German airplane bombed one of C Companies Billets that day, demolishing it and killing 12 and wounding another 6 men. Although Arthur was moved back to the larger casualty stations, he died later that day from his wounds, having been in the field for eight days and never having fired a shot. 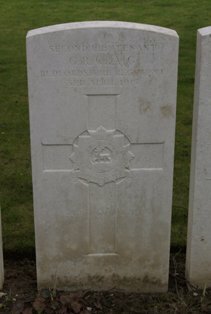 Arthur was the son of Joseph Robert and Sophia Lydia Pratt and is buried in the Noyon New British Cemetery. Between the 21st March and mid April 1918 (see here for a more detailed story) the battalion were heavily engaged in the German Spring Offensives that almost broke the British Fifth Army and left the 7th Battalion with around 200 survivors at the end of 23 March 1918. It also saw Haig's famous order; "Every position must be held to the last man: there must be no retirement. With our backs to the wall and believing in the justice of our cause each one of us must fight on to the end." In what would be their final series of major engagements before they were disbanded, the battalion lost their last six Officer fatalities, as listed below. Killed in action 22nd or 23rd March 1918, aged 23. Westropp was educated at Bedford Grammar school before the war and later joined the Sandhurst Royal Military College. He was commissioned into the regiment 12th May 1915, having completed his training as a Gentleman Cadet at Sandhurst, and landed in France with the battalion on the 26th July 1915. He seems to disappear from the battalion sometime in 1915 or 1916 but is back with them in time for the massive Spring Offensives in March 1918. Remarkably he was the only Officer killed during the battalions determined defence along the Crozat Canal on the 22nd and 23rd March 1918 when 4 Officers and around 250 of the battalion became casualties. His death was announced in the Times on the 26th April 1918 and commented that he had been attached to the RFC for 20 months, which may explain his absence from the battalions diaries and activities. Westropp was the eldest son of Frances Ada Macnab (formerly Winmill, Nee Peyton), and the late George Winmill. He was married to Myfaneny Winmill (nee Clarke) of Reading. He, along with all who fell along the canal over those two days, has no known grave but is remembered on the Pozieres Memorial to the missing which can be seen above. Marten was born in Leicester, around June 1890 but by the time war broke out, his family were in North Wales. He enlisted into the army at Rhyl in North Wales on 26th February 1915, becoming Sapper 82239 in the 126th Field Company of the Royal Engineers but was discharged to commission on 16th June 1915. At the time, he was a 24 year old Draughtsman, stood 5 feet, 4 inches tall, and he lived in the same house as his mother, being 'Prospect', Prestatyn, North Wales. He married Margaret Elizabeth during his service in the war, although I have not traced the details of this so far. Marten was gazetted as a 2/Lt on the 1st July 1917 and joined the 8th battalion in France soon afterwards, surviving the Third battle of Ypres and the Battle of Cambrai. He transferred from 8th to the 7th Battalion on 9th February 1918, along with another 7 Officers and 170 men when the 8th battalion disbanded and served less than two months with them before his death. Both Duplock and Craig (below) were casualties in a localized counter attack on the evening of the 2nd April when the remnants of the battle weary battalion, alongside the similarly exhausted survivors of the 11th Royal Fusiliers, attacked a German held village near Cachy, west of Albert. In a superb manoeuvre that one of the senior officers present described as "the finest piece of fighting" he had seen, the tiny band of exhausted British troops who had been fighting and retiring for almost two weeks, attacked a dug in, German held village and routed the entire garrison, killing around 100 and capturing 2-300 more in the process. However, the battalion lost a further 5 Officers and almost 50 men killed, wounded or missing and were forced to retire again overnight for fear of being overwhelmed by the superior German forces in the area. Marten was killed during the assault but his body was not recovered so he is remembered on the Pozieres Memorial to the missing which can be seen above. At the time of his death, his wife lived at 'The Central', Llanrwst, North Wales and there appears to have been a dispute of some kind relating to his will between his mother and wife, although details are not contained within his record. His service record is held at the National Archives, reference WO339/31581. Gordon was born in Uitenhage, Eastern Cape, South Africa on 21st October 1887, the second son of Robert and Rose Craig, of Port Elizabeth, South Africa. He was educated at Kingswood College, Grahamstown and left South Africa at end of 1906 to study at Royal Dental Hospital, London. On his return, he was professional assistant to Everard Digby (dentist) in Johannesburg, then partner in Port Elizabeth in the practice, Roper and Craig. In August 1916, he went to England and joined the Officer's Training Corps, was gazetted as a Temporary 2/Lt on the 25th February 1917 and arrived with the battalion that summer, when he was posted to C Company. He was wounded on the 8th August 1917 but remained at duty and fought at Glencourse Wood on the 10th but recovered and served with the battalion throughout the German Spring Offensives of March 1918. Second Lieutenant Craig finally fell mortally wounded on the 2nd April 1918, in the same action that Marten Duplock (above) was killed. He died the following day at a Casualty Clearing Station and is buried in the Namps-au-Val British cemetery, 16km south-west of Amiens. Oliver was gazetted in the Times as a Temporary 2/Lt on the 26th January 1915 and served in the battalion until his death in April 1918. His Military Cross (gazetted on the 13th September 1918) was earned on the day of his death and was for leading his Company in a counter attack during the battle at Villers-Bretonneux. He was the son of Oliver and Maud Matilda Kingdon of 84 Brownlow Road, New Southgate in London. He has no known grave but is remembered on the Pozieres Memorial to the missing which can be seen above. Captain Andrew Best McBRIDE, M.C. Killed in action 24th April 1918, aged 22. Andrew was born 16th June 1895 and educated at Berkhampsted Grammar school, where he was a Corporal in the cadets. He passed the senior Oxford local exams with honours as well as his first professional medical exam at the University of London. Andrew was gazetted as a Lieutenant in the Bedfordshire regiment in September 1914 and promoted to Captain in 1st June 1915. He was the Brigade's Musketry Instructor for a period and transferred in from the 8th battalion to the 7th when it was disbanded. His Colonel wrote to Andrew's parents "I cannot speak too highly of your son as an Officer in the recent fighting. He has done the most splendid work, showing great coolness under fire and his sound judgement on several occasions got his company out of difficult situations." 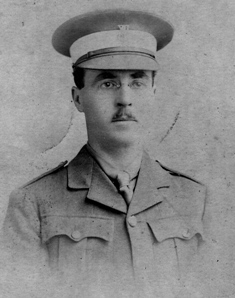 Captain McBride M.C., was killed at Villers Bretonneux along with Captain Kingdon (above) during the famous counter attack launched by British and Australian forces that almost cut of and wiped out an entire German regiment. He was the son of John Best McBride R.A.M.C.T. and Mary Constance McBride of Falkland House, Berkhampsted in Herts. Andrew is buried in the Longueau British Cemetery on the Somme. See here to see him in a group photo. Lieutenant (Acting Captain) Charles Alfred LAWRENCE, M.C. Charles was commissioned into the Bedfordshire Regiment on the 10th September 1915, trained with the Inns of Court OTC and arrived with the battalion the following year. He survived the Somme serving in C Company and is shown on the list of Officers going into action during the Ancre Operations in February 1917, when Stretcher Bearer Christopher Cox won his VC as well as at Glencourse Wood on 10th August 1917. His Military Cross was gazetted on page 40 of the London Times, 28th December 1917 and was probably for gallantry at Glencourse Wood the previous August. Charles fell at Villers Brettoneux along with the two veteran Officers above and is remembered on the Pozieres memorial to the missing, which can be seen above. He was the son of Mr. A.H. Lawrence of "Palmhurst", Gundulph Road in Chatham.